The list of Councils opting for Victoria Forms’ advanced eForms System for Benefits is continuing to grow. Offering a decade of experience, expertise and reliability in this specialist area. 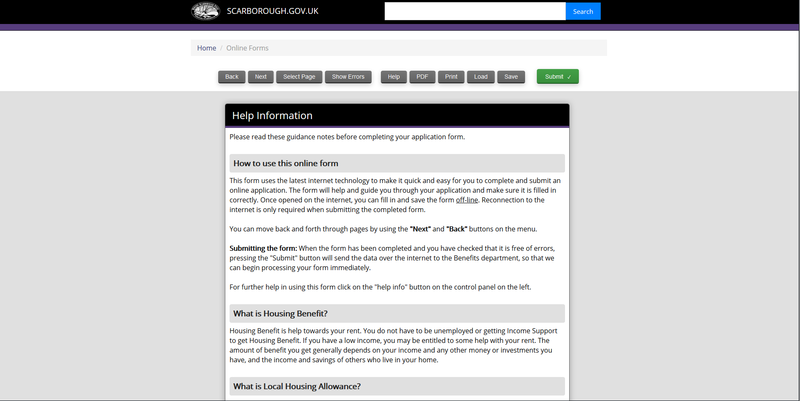 Central to the Victoria Forms Benefits solution is our interactive HB / LCTS application eForm, originally based upon the Department for Work and Pension’s HCTB1 form (LHA edition) and updated in order to reflect the need for Local Authorities to collect necessary information for its Local Council Tax Reduction / Support scheme and Welfare Reform changes, e.g. number of bedrooms within a Social Housing residence. The eForm is branded for individual authorities, and with additional design work, all aspects of this eForm may be further customised if required. The Enterprise Forms Server is the core system for forms administration. It handles hosting of forms, user access to blank and filled forms, and processes completed forms. It is suited for handling single mission critical forms, or a library of hundreds of forms. The list of Councils opting for Victoria Forms’ advanced eForms System for Revenues is continuing to grow. Offering a decade of experience, expertise and reliability in this specialist area. Central to the Victoria Forms Benefits solution is a library of over 70 ready-made Council Tax forms which are consistently updated in line with legislation. All eForms are branded for individual authorities, and with additional design work, aspects of any of our ready-made eForms may be further customised if required. New forms can be designed at any time. The Victoria Forms solution for Licensing comes with a library of ready-to-use template eForms, branded to your Authority, giving you an immediate return on investment and maximising customer self-service for legally prescribed Licensing applications and notifications. Combined with Victoria Forms’ Licensing Payments Module, in-form payments can be taken with integrated Back-Office systems for both Payments and Licensing management, removing the costly re-keying of data by your team. Direct Licensing Integration is compatible with any open back-office system – after eForm submission, data is exported as a formatted XML file that adheres to rules set by the specific back-office system, i.e. once accepted by the system, new cases will be set up or existing records updated automatically. The ability to integrate with licensing system lookups (e.g. holder address and premises address) and intelligent form level validations ensure applications are submitted error-free and with 100% reliability during completion, reducing your administration costs and providing a secure, reliable solution that will deliver proven efficiencies to your Authority. The Victoria Forms solution for Planning incorporates a map search function and calculates fees depending on what has been entered into the form. Our ready-made template eForms can easily be branded to your Authority, or we can design bespoke forms for your requirements. Combined with Victoria Forms’ Planning Payments Module, in-form payments can be taken with integrated Back-Office systems for both Payments management, removing the costly re-keying of data by your team. Direct Planning Integration is compatible with Idox Uniform – after eForm submission, data is exported as a formatted XML file that adheres to rules set by the specific back-office system, i.e. once accepted by the system, new cases will be set up or existing records updated automatically. The ability to integrate with Google Maps ensures that planning complaints are only reported once, and intelligent form level validations ensure applications are submitted error-free, reducing your administration costs and providing a secure, reliable solution that will deliver proven efficiencies to your Authority. A range of additional forms can be developed depending on your requirements. A range of forms can be developed, depending on your requirements. Developed over 3 years with Wigan Council – A Standalone Case Management System for Councils to manage Personal Budget and Welfare Support for clients referred to from DWP as part of Universal Credit shift, or coming through other routes. As Universal Credit claimants switch from direct payment of rent to their landlords and from weekly or fortnightly benefit payments to a single monthly payment, it is expected that significant numbers of claimants will struggle to manage their finances. 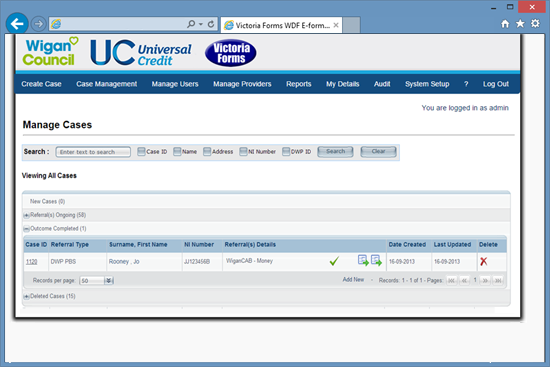 One of Victoria Forms’ longstanding users, Wigan Council, was selected by the DWP Universal Credit team to develop a system and accompanying processes to deal with Personal Budget Support cases. Working with regular feedback from Wigan Council, we have created a competent Case Management System that covers all aspects of a PBS case lifecycle, from initial contact and import into the system, through to managing appointments and outputting provider reports. The system is now available to any Local Authority taking on a the role of assisting Universal Credit applicants. Designed with DWP Personal Budgeting Support (PBS) team – system created for their specification. Allows a Council to track all of their PBS cases in one place. The system is capable of handling thousands of cases.